NEW YORK — Former Yankees manager, Joe Torre, was joined by MLB greats David Cone, Bernie Williams and John Franco on Nov. 13, 2014 to honor former Yankees pitcher Andy Pettitte for the 12th anniversary of the Joe Torre Safe At Home Foundation, which was founded in 2002 by Ali and Joe Torre in response to the impact that domestic violence had on Joe Torre and his family. Its mission is to educate to end the cycle of domestic violence and save lives. Bob Costas was master of ceremonies. Sources: LoHud Yankees Blog and MLB.com. 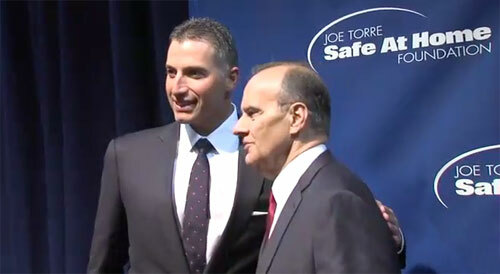 Photo shows Andy Pettitte with Joe Torre at 12th annual Safe at Home event on Nov. 13, 2014. The event will support the Foundation’s programming initiative, Margaret’s Place, named in honor of Joe’s mother. This violence prevention and intervention model offers students an opportunity to explore issues of violence in a stable, non-threatening environment, while helping them understand that they are not alone or to blame. There are currently 11 Margaret’s Places in NYC and LA, where they have reached more than 45,000 students through countless school-wide campaigns, healing activities, educational opportunities, and private and group counseling. Joe Torre is the former manager of the New York Yankees, St. Louis Cardinals & Los Angeles Dodgers. Torre was named manager of the Los Angeles Dodgers on November 1, 2007, but prior to the joining the Dodgers, Torre spent the past twelve seasons as manager of the New York Yankees. Torre is a sought after keynote speaker and has spoken for Fortune 500 companies across the country. Andy Pettitte is a former MLB pitcher who has played 17 seasons mostly for the New York Yankees. He played for the Houston Astros from 2004-2006. After the 2006 season, Pettitte left the Astros, and signed a one-year, $16 million contract with the New York Yankees with a player option for 2008 worth $16 million. On January 11, 2007, Pettite was re-introduced as a Yankee at a Yankee Stadium press conference. He has won five World Series championships with the Yankees and is a three-time All-Star. He retired on February 4, 2011.